Being Profitable in the Kingdom - Narrow Gate Trading Co. In the midst of a dusty woodshop…in the middle of a box beam delivery….in the process of unloading pounds of heavy leather hides…disciples are being made. That’s not exactly the image most of us think about when we think about disciple-making, but that’s because Narrow Gate Trading Co. doesn’t operate the way most disciple-making organizations do…they make disciples while running a business! For the past 5 years, the leaders of NGTC – Phil & Beth Stoner – have sacrificially discipled over 35 young men in the art and style of business and craftsmanship all while creating a profitable business that reflects the Kingdom at Work. Young men aren’t just building world-class products, they are also developing as world-class leaders in marketplace ministry. “One of the greatest joys we have is watching these young men grow as leaders, develop confidence in themselves and their skills and to watch them interact with our customers in a loving, serving, and professional way” – Phil Stoner. The young men are involved in every aspect of the business from product design, to vendor relationships, to product pricing, marketing, sales and customer service. Meet Blake Smith – our leather shop supervisor! Blake was introduced to leatherworking as a student at Narrow Gate Lodge, an 8-month discipleship experience where young men discover a life that matters. There are leather, metal, and wood-working shops located on the Narrow Gate property, and shop training is a part of the educational process Narrow Gate Lodge offers all its students. After Graduating from Narrow Gate Lodge, Blake joined the team of artisans at NGTC and began developing his craft of leatherworking. “I found that I really enjoy working with leather. Feeling it in my hands and being able to create with my hands reminds me of how useful I can be in the hands of God,” Blake shared. 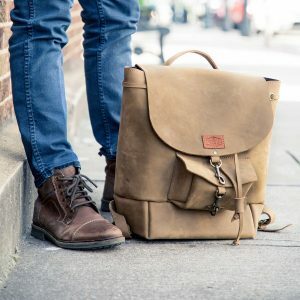 Over the past 3 years, Blake’s skills have greatly improved and he’s been able to develop more fully as a leather designer, recently playing a key role in the design of NGTC’s high-end leather bag collection. 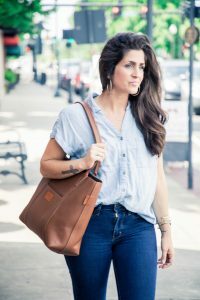 Each of these leather bags are being produced in limited quantities and the Tote is almost sold out!! It’s not too late for you to order and get your bag in time for Christmas!! 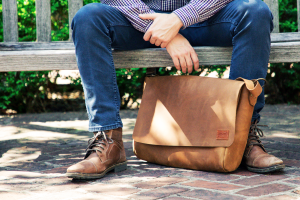 Each bag is hand-crafted from the time you place your order and will last a lifetime. It even comes with a lifetime warranty!